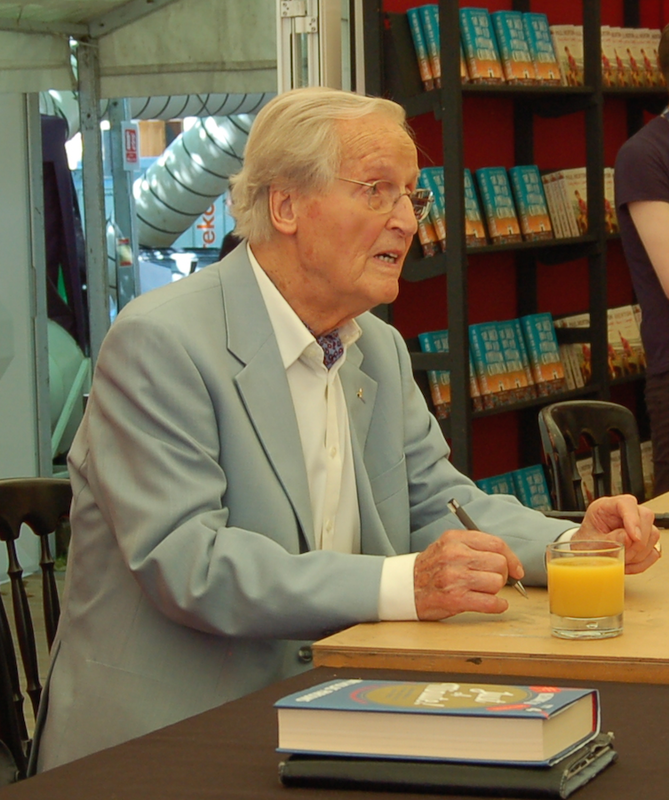 The blurb for this event says that Nicholas Parsons ‘came to the Nation’s attention’ with a 1970s quiz show called Sale of the Century, but as the event’s chairman Roy Cross pointed out, his career in show-business spans more than seventy years. 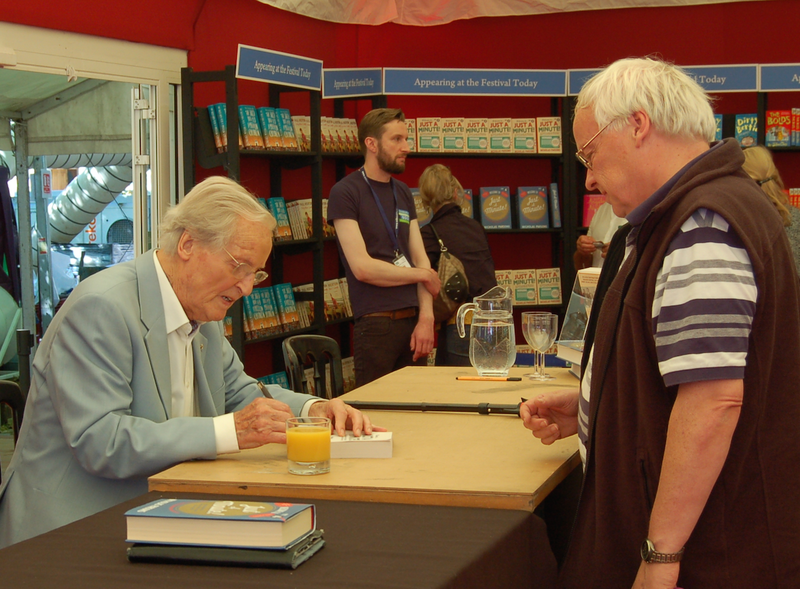 Nicholas is, in fact, ninety-one and still performing, having been the chairman of BBC Radio’s Just A Minute for forty-eight years. Before that, and before Sale of the Century, he was, as he pointed out himself, the straight man to many famous comedians. I can remember him as the foil to Arthur Haynes, for example. His longevity, both in terms of life and career, meant that he was a shoo-in for this event sponsored by The Oldie magazine. Many decades ago, I heard him on a radio programme called Workers’ Playtime. It was a variety show that toured factory canteens (remember factories?) and Nicholas was booked to do a stand-up spot. It was the proverbial lead balloon – maybe he was too ‘posh’, maybe his humour wasn’t obvious enough for the audience – he performed to near silence. But this air of slight haplessness has in fact served him very well in other fields, for example in the very role for which he is now famous, the barely-in-control chairman of a comedy game show in which the panelists rib him mercilessly. Arguably he is, as Roy Cross described him, a National Treasure. Certainly this event was a total sell-out, we being packed into the Baillie Gifford Theatre, sitting with our knees under our chins, abandoning all hope of personal space. His entrance was greeted by warm and loud applause, at which he stopped in mid stride as though surprised by it, turned, smiled in delight, and made a couple of slight, polite bows to us. Then he mimed being too frail to mount the stage, and the applause turned to laughter. See – he can be funny! His appeal lies in his ability to radiate good nature, to appear not to have an evil bone in his body, to be, to all intents and purposes, a thoroughly nice bloke with absolutely no ‘side’. Roy: Who has carried the show over the years? Roy: Who has helped you carry it, then? Nicholas (to the audience): I’m sorry – that was a cheap laugh. 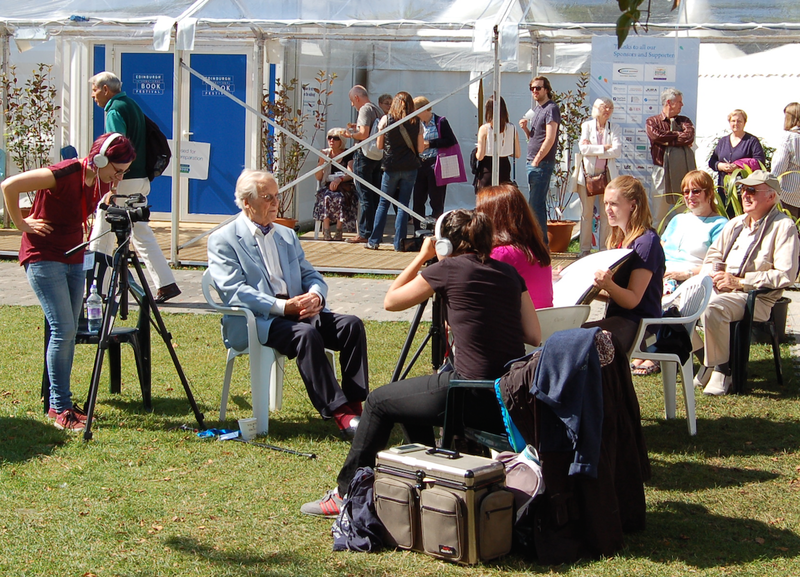 We are, of course, at a Book Festival, and the focus for the hour was on his book, Welcome to Just a Minute! 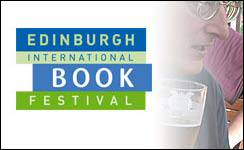 : A Celebration of Britain’s Best-Loved Radio Comedy, published by Edinburgh’s own Cannongate. Inevitably, therefore, the book was a comic vehicle itself. Covering up any brief memory lapse, or taking full advantage to wreak his own kind of revenge on the world by giving Roy Cross, as chairman, a hard time, Nicholas often interjected “Anyway, it’s all in the book!” That became a kind of instant catchphrase for the hour, and was greeted, as catchphrases always are, by chuckles and even guffaws. Once when he was trying to remember Marcus Brigstock’s name, Roy showed him a photograph in the book, to which Nicholas commented, “Yes, that’s him,” and continued his ramble. I shouldn’t really call it a ramble, more an inexhaustible peroration; it did take in a lot of what is “all in the book”. Nicholas told us about how he never wanted to be chairman – the BBC having had ‘Professor’ Jimmy Edwards in mind for the job – and had been rather coerced into it, about how it had changed over the years, about how Kenneth Williams enjoyed the opportunity to show off his self-taught erudition, Clement Freud to be autocratic, Wendy Richard to take it all too seriously, and Giles Brandreth to be fiercely competitive. The affection with which he spoke about even the most difficult panel-members, and those who struggled with their first time on the show, was marked. Moving away from his book, he spoke about his cricketing charity work with the Lords Taverners, the ‘JAM Clubs’ in India where enthusiasts get together to play their own version of Just A Minute, his love of jazz, the head-to-head battle with Giles Brandreth for the Guinness record for the longest after-dinner speech, and his general practitioner father who brought Margaret Roberts (later Margaret Thatcher) into the world, only to wish he had “shoved her back again”. That was, I think, the closest he got to saying anything remotely nasty about anyone. I have to admit that I have never been his greatest fan. However, I enjoyed this event thoroughly, finding him a pleasure to listen to. The fact that he found time for this, and to be interviewed beforehand, and to sign books afterwards, indicates to me that the ‘nice chap’ image is a genuine one. I hope he goes on being that nice chap for many years yet.